Bestseller! 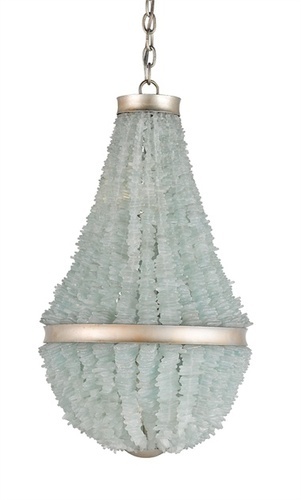 Organic materials inspired this bestselling chandelier. Strand upon strand of carefully chosen natural Seaglass recalls seaside strolls and ocean breezes. The classic silhouette and lovely materials of this sublime chandelier are accented with Contemporary Silver Leaf detailing. Measures: 17"rd x 30"H and takes six 60 watt candelabra lights for a 360 watt total. Ships common carrier. Eligible for return or exchange with 15% restocking fee. Please view our return policy for details.